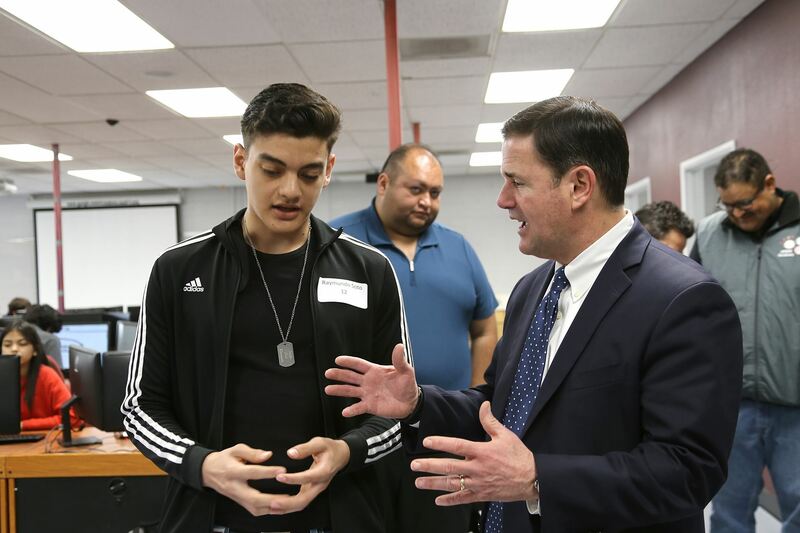 The Sunnyside District was delighted to host Arizona Governor Doug Ducey and State Representative, Daniel Hernandez, Jr. on a tour of Desert View High School's iSTEM Academy on Friday, February 15. Desert View students led the tour which included visits to engineering classrooms, precision manufacturing workspaces, computer aided design classrooms, engineering workshops and precision measurement labs. Governor Ducey’s Fiscal Year 2020 budget seeks $10 million in support of Career and Technical Education programs to expand Arizona’s competitive workforce and prepare students for the jobs of tomorrow. Raymundo Soto, a student in the drafting lab explains his proof of concept and answers questions from Governor Ducey. 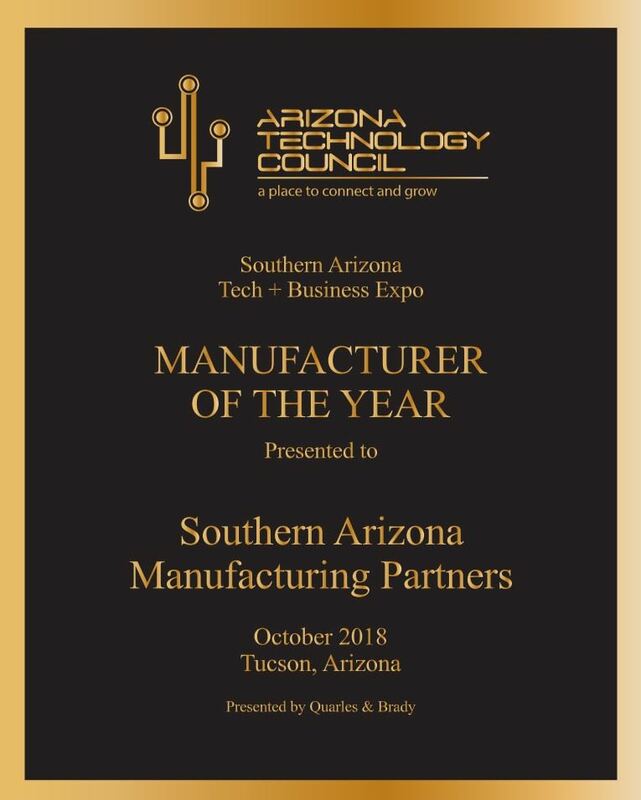 The Arizona Technology Council awarded SAMP the 2018 Southern Arizona Manufacturer of the Year. Donny Theriault accepted the award on behalf of SAMP and the Southern Arizona Tech + Business Expo. SAMP was recognized for leadership in developing a program that has shown proven results connecting industry-certified education at the high school and college level with real work experience with local manufacturers. This model is the future for developing and mentoring the manufacturing workforce of the future. Listen to Arizona 360's coverage of SAMP's Industry Summit, where educators toured a local manufacturer to understand the career path in manufacturing. "There's a shortage of skilled machinists across the country. In Pima County, initiatives led by the Southern Arizona Manufacturing Partners attempt to fill those demands. Local manufacturers have partnered with the county to recruit high school students interested in trade and manufacturing jobs. Instead of reaching out to students directly, they are getting the word out to school counselors and teachers whom students often seek advice from about opportunities after graduation. Lorraine Rivera joined a group of counselors as they toured a company in Tucson that manufactures archery equipment. TUCSON, AZ (Tucson News Now) - Creating, designing, and building. Inside Cesar Gutierrez's classroom are our future engineers. "When I first saw these machines, I was terrified because they’re these big machines and I’m like, 'Oh my God. This is scary,'” junior Iridian Mong said. Gutierrez is opening up a new world for students in the manufacturing program at Desert View High School. "We can create your shoes. We can create a computer,” Mong said. "They make that connection between real world and the actual theory behind math,” Gutierrez said. On January 11, 2017 SAMP members, students and teachers celebrated Desert View and Tucson Magnet High Schools and Pima Community College (PCC) receiving National Institute for Metalworking Skills (NIMS) accreditation for their Machining Programs. NIMS accreditation means that the curriculum students are taught meet national standards. NIMS sets skills standards for the industry, certifies individual skills against the standards and accredits training programs that meet NIMS quality requirements. This achievement wouldn't have been possible without the dedication of SAMP members and instructors Ray Wiggins and Chris Williams from Tucson Magnet and Cesar Gutierrez from Desert View High Schools, and Greg Wilson from PCC. Watch the celebration video to learn more about NIMS accreditation. 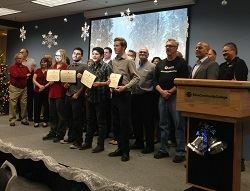 The Southern Arizona Manufacturing Partnership, Pima Community College and Pima County One-Stop celebrated the graduation of four SAMP interns on December 14, 2016. Austin Bartel, Ernesto Moreno, Jonatan Ayala, and Elizaveta Packard successfully completed the Machine Tool Technology Certificate Program! The interns successfully completed the internship program with SAMP manufacturers while attending Pima Community College. The program gave the interns a leg up on applying the information they learned in class on the manufacturing floor. SAMP looks forward to the next graduating class in 2017! More than 120 high school students, ranging from freshmen to seniors, visited 13 different manufacturing companies Friday as part of a career and technical education program. Pima County Youth Career Connects trains Southern Arizona’s high school students in industrial technology. It sends them to two years of school at Pima Community College and sets them up with job training, according toGerri Brunson, a coordinator for Arizona @ Work, the workforce solutions division of Pima County.